Western blot analysis of whole cell lysates probed with calpain-2 antibody (VMA00164) followed by detection with HRP conjugated Goat anti Mouse IgG (1/10,000, STAR207P) and visualized on the ChemiDoc™ MP with 60 second exposure. Arrow points to calpain-2 (molecular weight 80 kDa). Calpain-2 antibody recognizes calpain-2 catalytic subunit, also known as CANP 2, M-calpain, calcium-activated neutral proteinase 2, large [catalytic] subunit, calpain M-type, calpain large polypeptide L2 or millimolar-calpain. Mouse anti Human calpain-2 antibody recognizes calpain-2, also known as CANP 2, M-calpain, calcium-activated neutral proteinase 2, large [catalytic] subunit, calpain 2, large subunit, calpain M-type, calpain large polypeptide L2, calpain, large polypeptide L2, calpain-2 catalytic subunit and calpain-2 large subunit millimolar-calpain. The calpains, calcium-activated neutral proteases, are nonlysosomal, intracellular cysteine proteases. The mammalian calpains include ubiquitous, stomach-specific, and muscle-specific proteins. The ubiquitous enzymes consist of heterodimers with distinct large, catalytic subunits associated with a common small, regulatory subunit. The CAPN2 gene encodes calpain-2. Multiple heterogeneous transcriptional start sites in the 5' UTR have been reported. Two transcript variants encoding different isoforms have been found for CAPN2 (provided by RefSeq, Mar 2009). 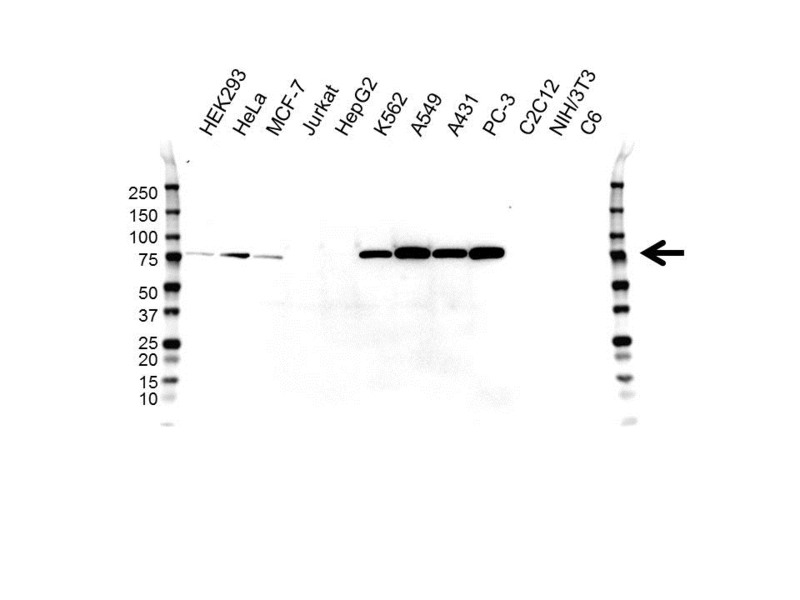 Mouse anti Human calpain-2 antibody detects a band of 80 kDa. The antibody has been extensively validated for western blotting using whole cell lysates. Anti calpain-2 detects a band of approximately 80 kDa in K562 cell lysates.